Ori Amiga is the Principal Group Program Manager on the Windows Azure team responsible for the Developer Platform efforts. He joined Microsoft in 1999 as a Program Manager in the Enterprise Server division. In 2002 he joined the Mobile and Embedded Devices division, and drove the development platform offering for Windows Mobile and later as the Group Program Manager for the Visual Studio for Devices team. 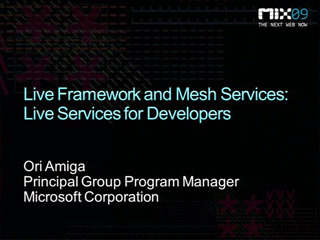 In 2005 he became the GPM for the Visual Studio Tools Platform team in the Developer Division, and most recently drove the Live Mesh / Windows Live Developer Platform. In his spare time, Ori is an avid traveler, enjoys motoring, gaming, and tennis.